Canadian Solar may be one of the biggest solar manufacturers in the world, but that doesn't guarantee success in a highly competitive industry. The effects of a sharp decline in solar panel prices are finally being felt by some of the world's largest solar manufacturers, and today it was Canadian Solar's (NASDAQ:CSIQ) turn to report a down quarter. But this quarter may be more notable than those that came before it. Canadian Solar's shipments in the fourth quarter were 1,612 MW, behind JinkoSolar Holding Company's (NYSE:JKS) 1,733 MW; its gross margin of 13.9% (on an adjusted basis) was also lower than the 14.3% at JinkoSolar. We could see Canadian Solar falling behind another major competitor. And if margins continue to drop, it could be bad for the company's expansion plans over the long term. But the easy-money projects are now gone from financial results, and the company is competing by selling solar panels and developing solar projects, just like everyone else. The reality of not having these high-margin projects is that margins are dropping like a rock. In the fourth quarter, gross margin was 13.9%, versus 17.8% a year ago; if we include the true-up provision for anti-dumping and countervailing duties (tariffs), the gross margin was just 7.3%. The company also swung to a net loss of $13.3 million, or $0.23 per share, showing just how far operations have fallen from their peak in 2015. 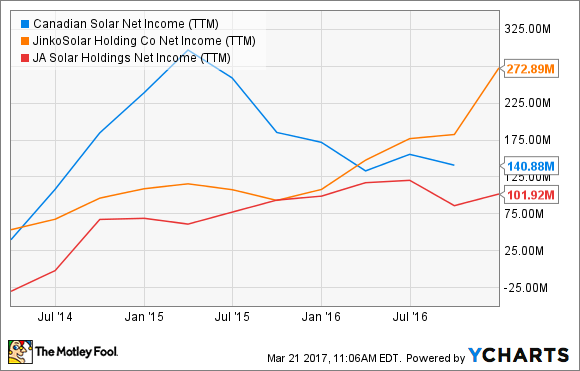 This compares to net income of $45.9 million at JA Solar Holdings (NASDAQ:JASO) in the fourth quarter, and $21.0 million at JinkoSolar. What does Canadian Solar look like from here? The rough financial performance has been driven by falling solar-panel prices, a lack of high-margin solar-project sales, and management's continued decision to grow the business at all costs. If you look at 2017 guidance, management expects to ship 6.5 GW to 7.0 GW of solar panels, up from 5.2 GW in 2016. They're also doubling down on project development with a 2.1 GW pipeline that's being added to an already highly leveraged balance sheet. Think about that for a moment: Canadian Solar is expanding production at a time when it's losing money selling solar panels, and is building more solar power plants in an environment where power-plant margins are shrinking, and in some cases, negative. On top of it all, the company is sitting on $3.1 billion in debt. Usually scale is a strong asset in the manufacturing business, but in the case of Canadian Solar, it's the cost of building out scale that's putting the company in a precarious position. And with competitors reporting margins and profits that meet or exceed Canadian Solar's, it may not have the competitive advantage investors hoped it would heading into 2017.